1. Too long at 450 pages: The novel doesn't really "take off" until the last 100 pages or so, and jumps around among too many characters and plotlines to make any one sufficiently interesting before then. 2. Time scale seems to be off: Some Romulan sub-light ships get through a defense grid in a system's Kuiper Belt (for reference, the Solar System's Kuiper Belt is beyond Pluto) and two paragraphs later are screaming through the target planet's atmosphere. Even at warp speeds, it takes some time to cross that distance. I think this bothered me because, otherwise, Martin is pretty good about recognizing and dealing with the fact that crossing interstellar distances takes TIME, especially in an era before ships could go faster than warp 5 (that's about a light-year every 2 days to you and me). 3a. The inability of Earth and her allies to figure out how the Romulans were getting through their warp-field-detection grids was played out a little too much. 3b. Related to that, Martin gives the Romulans a device that sneaks a virus into enemy ships that allows them to take over control of the ship and it takes the good guys forever to accept its existence and try to counteract it. You'd think after the umpteenth frakking encounter when everyone's ships went dead in space, the Coalition would try to avoid any further battles until they had a reasonable countermeasure. And this remote-control virus seems more powerful (potentially) than the Romulan's fabled cloaking device - why didn't they spend the century between the Earth-Romulan War and "The Balance of Terror" perfecting that? 4. The idea introduced in "The Balance of Terror" that the Romulans were never seen because of the primitiveness of the ships used at the time of the war was always pretty "iffy" but the pretence can't be believably sustained considering how the series developed the Romulans. I've never liked the notion that the split between Vulcan and Romulus is only about 2,000 years old, or that Vulcan would conceal that fact until forced to reveal it after "The Balance of Terror," and the illogicality of that is brought out forcefully in this novel. Overall, it's not a bad book. 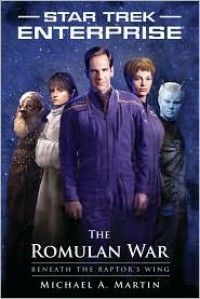 Definitely in the "brain candy" category and I'll probably have to read the follow up just to get closure on the Romulan War (the book ends mid-war with things looking grim for Earth).